Last year, Loren posted about gifting Good Meat to his brother. After receiving the book, Loren’s brother sat down to give it Saturday read with a few cups of tea. I had the much the same experience when I got my hands on Truly Mexican. 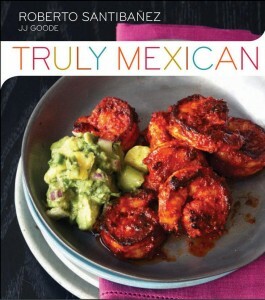 The author Roberto Santibanez is the head chef of Fonda (the restaurant that redefined Mexican food for me). Before I’d eaten at Fonda, I heard Santibanez on The Splendid Table and knew I had to learn more about real Mexican food. My meals at Fonda have blown me away and I could only resist buying this book for so long. The cookbook offers up page after page of instruction, recipes, and beautiful photos. The reader is taken through the basics (how do you core a tomato, roast garlic, or pit an avocado) through easily executed salsas, guacamoles, and adobos to the advanced 22 ingredient multi-hour process that is the legendary mole poblano. Another thing I love about this cookbook is the fact that Santibanez recognizes that owning the book doesn’t mean that you automatically live in Mexico or give you access to markets filled with the proper ingredients. To help bridge the gap between grocery store reality and Mexican cooking necessity, Truly Mexican lists a number of websites where more obscure chilies and other ingredients can be purchased and offers a few alternative chili peppers for some of the dishes. I know it would be great to make my way to a proper store to purchase these items, but it’s nice to know I don’t have to to get what I need. I haven’t gotten to cooking anything from here yet, but, once I’ve take care of Thanksgiving leftovers, Taco Tuesday better look out! For now, I’m happy to page through this tasty tome before bed.